TOP DOLLAR PR - PROMOTING AWARD-WINNING COMPOSERS, MUSIC PRODUCERS AND SOUNDTRACKS. 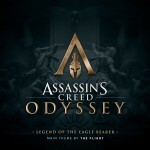 Ivor Novello award-winning composer/producer duo The Flight (Horizon Zero Dawn) are scoring Ubisoft’s ASSASSIN’S CREED ODYSSEY set in Ancient Greece. The main theme music “Legend of the Eagle Bearer” has been released as a single on streaming services and for digital download. Top Dollar PR is a boutique music PR agency dedicated to promoting the new generation of extraordinarily talented composers creating original music for interactive entertainment and other media. We have over two decades of music industry experience encompassing international A&R and press at major and independent record labels (including Billboard chart hits), live concert promotion and interactive media. Among our diverse roster of award-winning clients, we represent innovative media music artists, A-list composer talent in video games and many of the genre’s best-selling and top trending soundtracks. Notable industry benchmarks include lobbying to instate the music category at the British Academy of Film and Television Arts Video Game Awards, coordinating publicity for the best-selling original video game soundtrack album of all time, Halo 2 (Sumthing Else Music Works), multiple award-winning press campaigns (Assassin’s Creed, BioShock, Dead Space, Deus Ex, Fallout, Hitman, Mass Effect, Ori and the Blind Forest, The Last Guardian, Tomb Raider, Uncharted, The Witcher), and launching the international video game music conference Game Music Connect. Top Dollar PR is a division of Music4Games, Inc.